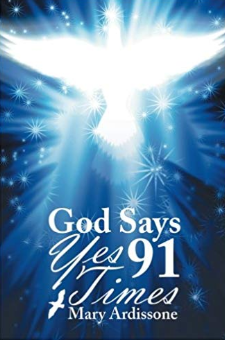 In "God Says Yes 91 Times," the author walks readers through her life-changing experiences that shows how God’s grace works even in the most difficult times in one’s life. At one point in her life, Mary Ardissone went through a challenging time in her life. She was in a period of unemployment and financial instability. Throughout those moments, she often questioned if God really cared about her and wondered if He even hears her prayers at all. In “God Says Yes 91 Times,” Ardissone opens up these questions and doubts and about her experiences during this time in her life. She also talks about challenging God to remind her of her prayers that were answered “yes.” As she writes these thoughts and experiences, she emphasizes her book’s greatest message: anything’s possible with God. Through her book, readers will discover that it’s okay to let go and trust that God knows what’s right for you. Most of all, she highlights that prayers are powerful weapons in everyone’s lives and that God will always answer them. Soon, Ardissone’s “God Says Yes 91 Times” will be on display at the upcoming Los Angeles Times Festival of Books along with many great titles from different genres. The grand literary celebration will take place at the University of Southern California on April 13-14, 2019. Don’t miss it!